Relief Foods has put together a Premium one-month family combination package. This incredible package includes everything that our Essential Family Combo Pack offers, but also comes with a larger variety of entree meals, more fruit, and even more Relief Fire. 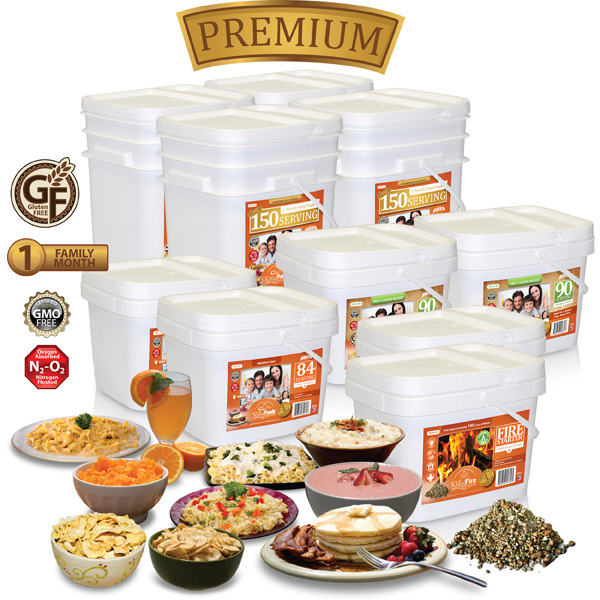 Included in this combinations is four of our premium 150-werving all entrée buckets, two of our 84-serving delicious breakfast buckets, two of our 90-serving fruit lovers buckets, and finally two buckets of our trusted Relief Fire starter. A great family combination prepared by Relief Foods with family in mind. Included Inside: Italian Pasta Marinara (72 Servings), Rice Pilaf (48 Servings), Pasta Alfredo (72 Servings), Stroganoff (48 Servings), Enchilada Beans and Rice (48 Servings), Cheese and Broccoli Bake (48 Servings), Macaroni & Cheese (72 Servings), Classic Chili Mix (48 Servings), Creamy Potato Soup (48 Servings), Corn Chowder Soup (48 Servings), Cheddar Broccoli Soup (48 Servings).